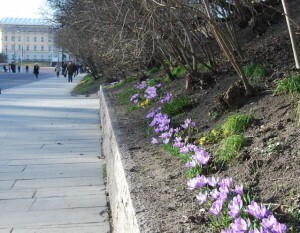 The crocus is in full bloom in many places around southern Norway, like here on the grounds of the Royal Palace in Oslo. Record warm temperatures for the past two weeks have led to early blossoming, and the weather is predicted to stay mild. While it’s raining heavily in some areas, the sun has been shining brightly almost without interruption in the Oslo area, elsewhere in southeastern Norway and along the southern coast called Sørlandet. Residents there have already had their first summer-like day, with temperatures over 20C (nearly 70F). Few Norwegians complain about warm days and sunny skies, especially after months of winter, but the sudden onslaught of balmy weather has brought an early and abrupt end to the ski season, threatens plans for traditional Easter skiing holidays and raises concerns about global warming. In Oslo, residents are stuck with dirty streets and sidewalks filled with the sand and gravel used to make them less slippery in the winter, because city officials never start the annual spring street cleaning until well into April. State meteorologists say the warn weather is a result of warm air from sub-tropical areas that has floated over Norway in a high-pressure system that’s been around for several days. The warmest official temperatures in the country were recorded at Landvik near Grimstad in Aust-Agder on Thursday, and they set a new record. “A temperature of 20.2C is a new Norwegian record for March, and the earliest recording of a temperature in the 20s ever in March,” meteorologist John Smits told Norwegian Broadcasting (NRK) weather site yr.no. He said the first yearly recording of a temperature in the 20s last occurred in 1946, on April 3. It was over 19C in some areas of Telemark on Thursday and another record was set in Oslo also, with an official temperature recording of 18C at the Blindern weather station. The last record for the month of March was set on March 27, 1929, when thermometers hit 17.5C. In northern Norway, however, temperatures were still below the freezing point, extending the winter tourism season. Temperatures in southern Norway may drop a bit during the weekend, but were still expected to remain in the double digits during the day.